CarGurus has 36,525 nationwide Colorado listings starting at $1,799. An available V8 powerplant, affordable pricing, a plethora of configurations and small-car maneuverability all contribute to the 2012 Chevrolet Colorado’s continued presence in the U.S.
A couple of weak inline engines, a lackluster cabin with few state-of-the-art features, poor safety scores, cramped rear seating in 4- and 5-seat trims, and just a certain lack of refinement keep the 2012 Colorado mini-truck from gaining on its rivals. Although a bit dated and not at all posh, the 2012 Chevrolet Colorado, along with its GMC Canyon sibling, remain the only domestic small pickups still available in the U.S. As such, they flaunt value and practicality, though not a whole lot of muscle with their base inline engines. The available V8, however, ought to mitigate that comparative lack of oomph. 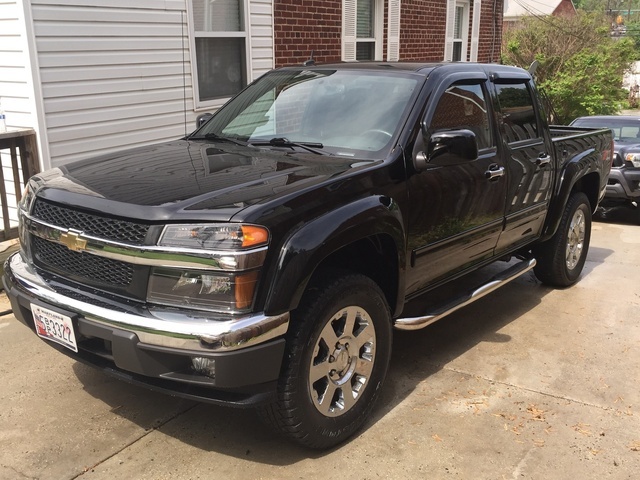 If a full-size pickup is overkill, and refinement and comfort don’t matter a whole lot, then this compact pickup should do just fine. Yeah, it’s a bit dated, but the 2012 Chevrolet Colorado sure looks like it means business. And yeah, it’s a compact pickup truck, but unless you’re hauling 10,000 pounds of trailer, running up and down mountain roads, and constantly toting a bed-load of stuff all over the place, it’ll do the casual pickup-truck jobs just fine. For the money, this mighty-mite isn’t exactly luxury-oriented, but if a truck that does truck-like things is in your future, fancy doodads and a plush interior are the last things on your mind. All in all, despite its faults, like a distinct lack of refinement, cramped rear seats and a faint-hearted base 4-cylinder engine, this little hauler gets stuff done for cheap money and remains (with its Canyon cousin) the last domestic small pickup standing. Again, the 2012 Colorado lineup consists of the base Work Truck, the lower midlevel 1LT, the upper midlevel 2LT and the top-shelf 3LT. Work Trucks are available in the 3-passenger Regular cab and 5-passenger Extended cab (small, rear-opening back doors) versions. The 1LT comes in Regular cab, Extended cab and Crew cab versions, with the Crew cabs sporting 4 independently opening doors. Additionally, the Colorado is once more available in 2 bed lengths, with Regular and Extended cab trims sporting a 6.1-foot bed and Crew cab versions featuring a 5.1-foot bed. Finally, all trims flaunt standard rear-wheel drive (RWD), though all except the 3LT are available with GM’s InstaTrac on-demand 4-wheel drive (4WD) system. A few tweaks to standard features and options as well as a standard auto-locking rear differential in the higher trims are the only noteworthy additions for this year. Chevy insists that the 2013 Colorado will sport a new look, added features and a bit more refinement, though there are those in the media who wonder if maybe GM should follow the crowd (Dodge/Ram and Ford) and get out of the U.S. small-truck market altogether. Toyota’s 2012 Tacoma and Nissan’s latest Frontier each beat the Colorado in refinement, comfort, features and, especially, performance, with the V6 engines common to both Japanese trucks far out-stripping the inline 5-cylinder powerplant that represents the Colorado’s mid-level engine. 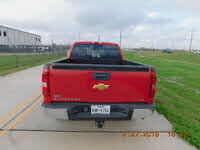 Neither Asian compact hauler, however, offers the muscle mass of the Chevy’s available V8. 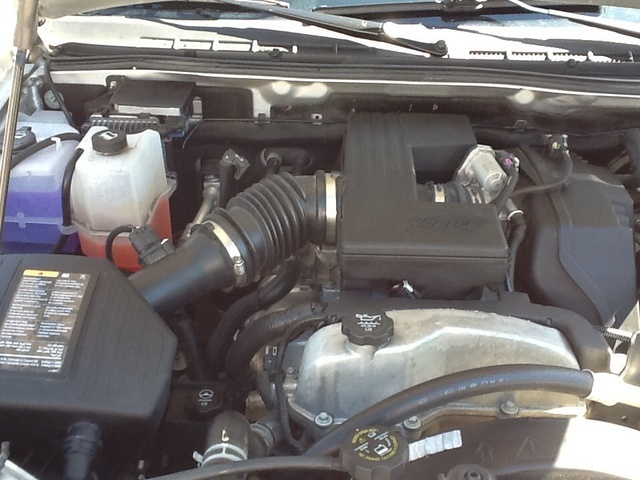 The standard engine for the Work Truck, the 1LT and the 2LT trim levels is a variable-valve-timed (VVT) 2.9-liter inline 4-cylinder (I4) mill that puts out 185 hp at 5,600 rpm. When combined with either the Work Truck’s standard 5-speed manual transmission, or the 4-speed automatic that comes in the 1LT and 2LT (it's optional for the Work Truck), the four-banger puts out 190 lb-ft of torque at 2,800 rpm. Towing is maxed out at 2,400 pounds with optional towing equipment installed, while mileage in the standard RWD variations is estimated at 18 mpg city/25 highway, and available 4WD editions are estimated at 18/24. Standard aboard the 2LT as well as the 1LT 4WD Crew cab variants, and optional for all trims except the 3LT, is a 3.7-liter inline 5-cylinder (I5) powerplant that pumps out 242 hp at 5,600 rpm and 242 lb-ft of torque at 4,600 rpm. The 4-speed automatic transmission is standard with the I5, while towing capacity is bumped to 4,000 pounds with the proper equipment, in this case a tow package that comes standard on all I5-equipped 4WD Colorado trims. Mileage in the VVT five-banger, meanwhile, is estimated at 17/23 in both RWD and 4WD editions. Finally, a peppy VVT 5.3-liter V8 powerplant is standard in the 3LT trim level and available to the 2LT editions, along with the standard 4-speed automatic. Look for 300 hp at 5,200 rpm and 320 lb-ft of torque at 3,600 rpm from this potent V8, with mileage estimates dropping to 14/20. 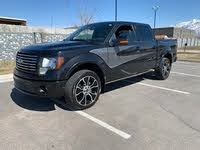 Towing, however, is jacked up to 6,000 pounds, with V8-equipped trims toting a standard towing package. Reviewers find the I4 and I5 engines to be perfectly adequate around town, but neither can compete, performance-wise, with the V6 powerplants flaunted by the Japanese compact pickups. The Chevy’s 4-speed automatic transmission shifts smoothly enough, but according to most reviewers can’t give the required oomph for worry-free passing and towing in either the I4 or I5 engines. Additionally, reviewers note that neither of the smaller engines sounds particularly refined on hard acceleration, though most concede that both quiet down nicely at highway speeds. Of course, reviewers are quick to note that such highway angst is eliminated with the V8 powerplant, but be advised that, with its standard sport-tuned suspension, the V8-equippped Colorado can’t tow as much weight as the Tacoma’s 4.0-liter V6. Boasting a standard front independent short and long arm suspension, a solid live axle rear end and stabilizer bars fore and aft, the 2012 Colorado is decently sprung for ride comfort, according to most reviews. The beefier off-road suspension standard in 2LT trims, as well as the tricked-out sport suspension system in the 3LT, will, note virtually all reviewers, detract noticeably from the ride, though the usual jittering over rough pavement that’s common to this type of vehicle is present, no matter the suspension. A couple of reviewers complain that the off-road suspension particularly can become wearisome on long trips. In any case, lower trims sport 16-inch wheels and all-season tires, while the 2LT boasts 17-inch wheels and all-terrain tires, and the 3LT rolls on standard 18-inch wheels and tires. As is traditional, the larger the tire, the choppier the ride in Chevy’s compact pickup, especially with an empty bed. Handling, meantime, seems a matter of reviewer opinion. Many are pleased with this mini-pickup’s reasonable cornering abilities and straight-line cruising confidence, while others claim a slow reaction to steering inputs. Virtually all reviewers are quick to note that the 4WD Colorado will be less maneuverable in tight spaces than the RWD version due to its inherently larger turning radius. Braking in the 2012 Colorado line is found by all reviews to be powerful and true, with no pedal glitches noted. Though considered Spartan by most reviewers, the 2012 Colorado sports a number of standard features that appeal to the dedicated small-pickup enthusiast and a couple that won’t be found standard on higher-priced rivals. The base Work Truck, for instance, boasts premium cloth upholstery, steel wheels, bench front seats, tilt-wheel steering and cruise control. Additional niceties include air conditioning, a leather-wrapped steering wheel, simulated alloy cabin accents and floor mats. OnStar/Bluetooth Directions and Connections service also comes standard, while entertainment is confined to an AM/FM stereo with 2 speakers in Regular cab configurations and Extended cab Work Trucks sporting 4 speakers. The 1LT adds alloy wheels and full power accessories, including power windows, remote power door locks and power-adjustable outside mirrors, as well as the brand-new auto-dimming rear-view mirror. An MP3-capable single-CD player with an additional 2 speakers in Extended and Crew cabs also comes standard, as does satellite radio with three months of complimentary service. In addition to the I5 engine and off-road suspension, the 2LT tosses in front bucket seats, a sliding rear window and, in 4WD versions, standard trailer-towing equipment. Finally, the 3LT comes equipped similarly to the 2LT, distinguished most notably by its 18-inch alloy wheels, standard V8 powerplant and the sport-tuned suspension. Optional equipment in lower trim levels include a number of items found standard in the higher levels, while all trims offer such added amenities as upgraded wheels, splash guards, molded or tubular side assist steps and exterior protection packages. The 1LT can be delivered with a Street Pack II Appearance Package that boasts added exterior chrome and a mesh grille, while all Crew cab trims are eligible for available leather upholstery. Reviewers find, once again, that the 2012 Colorado loads too much hard plastic into the cabin, while interior build quality is no match for those aforementioned Japanese rivals. Road and wind noise can be problematic, according to a number of reviewers, while rear-seat comfort is all but nonexistent in Extended cab trims and, in Crew cab variants, barely adequate for young children. At least one review notes a disturbing number of squeaks and rattles from the Spartan dashboard. On a more upbeat note, all reviewers are pleased with the large and well marked gauges, also noting that instruments are well-located and easily manipulated, even while wearing work gloves. Generally, however, reviewers are quick to point out that Chevy’s affordable compact pickup is designed with practicality and utility in mind, thereby excusing some of its less-than-luxurious appointments. Notable standard safety equipment in the 2012 Colorado lineup consists of 4-wheel antilock brakes (ABS) with electronic brakeforce distribution, as well as traction and stability control. Then, of course, there are standard front—and in Extended and Crew cabs, rear—head airbags, front fog/driving lights, daytime running lights, a post-collision safety system and OnStar emergency services and alerts. The 2LT and 3LT, meanwhile, additionally sport GM’s PASSlock theft-deterrent system, with the 3LT also boasting standard dusk-sensing headlights. Be advised that the ABS system is a front disc/rear drum arrangement, which some experts claim to be perfectly adequate. Others scoff, though, that this setup is cheaper and less effective than 4-wheel disc brakes. In any case, despite carrying most of the traditional safety equipment found in 2012 pickup trims, the Colorado lineup continues to suffer poor safety scores, perhaps due, in part, to its lack of side-mounted airbags. The National Highway Traffic Safety Administration (NHTS) tested the 2012 Colorado only for rollover safety and awarded its second-best 4 stars. Meantime, the Insurance Institute for Highway Safety (IIHS) gives Chevy’s little hauler its second-best rating of Acceptable in front impact tests, while side-impact tests resulted in the Institute’s worst score of Poor. Roof strength testing resulted in the IIHS giving the Colorado a next-to-worst Marginal rating, with overall test results gaining only the same Marginal score. 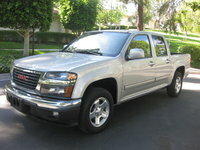 The overwhelming reason for owner dissatisfaction with Chevrolet’s 2012 Colorado is its low-rent cabin. Too many hard plastics are the major culprit, though the lack of rear-seat room also deserves a share of the blame, according to more than a few owners. Some mechanical issues come in for a small share of owner discontent, as does the less-than-symphonic quality of the standard stereo system. Finally, a number of owners find mileage with the V8 less than economical, though virtually all understand that more power indisputably requires more gas. On the positive side, a majority of owners differ with most reviewers in that they find the Colorado lineup to be a value-laden light-duty pickup, eminently suited to non-industrial chores. Many owners are perfectly fine with the performance and the mileage they get from the I5 powerplant, while virtually all owners find ride and handling far superior to what reviewers generally claim. Additionally, many owners remain impressed with this little Chevy’s aggressive, truck-like appearance, though more than a few are waiting to see what the rumored 2013 facelift will produce. What's your take on the 2012 Chevrolet Colorado? 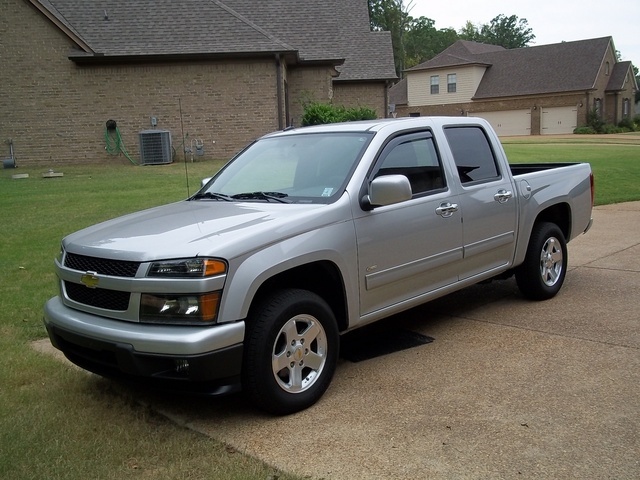 Have you driven a 2012 Chevrolet Colorado? How Do I View An Add That Was Removed?